Perfectly crisp, crunchy pork rind makes an irresistible snack. This traditional British recipe is one for the food lovers rather than the calorie counters. Pork scratchings are a delightfully unhealthy British pub snack, that provide an addictive delivery of crunchy, salty pig fat. Pork rind and the subcutaneous layer of fat are cooked over a low, slow heat until tender, and then roasted at a high heat until the skin dries into crisp curls. 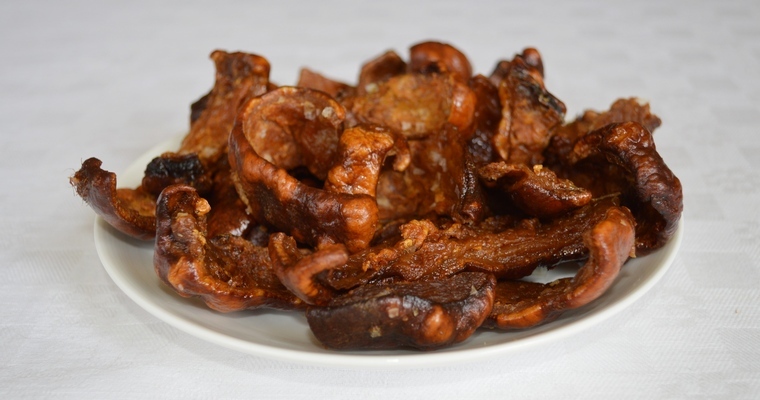 Pork scratchings can also be ground into pork ‘dust’ and sprinkled over collard greens or salads as a smoky bacon seasoning, or used as gluten-free breadcrumbs in fried chicken. Place the skin in a saucepan and cover with cold water. Place a plate with a smaller diameter than the pan on top to weigh down the skin. Bring to the boil, then reduce the heat to low. Cover, and leave to simmer gently for 2 hours, or until soft and pliable. This tenderises the tough skin and renders out a lot of the fat. Drain, and discard the cooking liquid. Transfer to the refrigerator, uncovered, and leave to cool completely – about 2 hours. If you are using leftover skin from a hock that you have braised for several hours, you can skip this step. Preheat the oven to 130°C/265°F. Use kitchen scissors to cut the skin into strips about 3 cm wide. Place in a large metal roasting tray. Sprinkle over the salt, and toss until evenly coated. Arrange the strips skin-side up in a single layer, giving them plenty of room to roast and crisp up. Transfer to the highest shelf of the preheated oven and cook for 1 hour. Remove from the oven and flip the strips over so that they are skin-side down. If lots of fat has rendered out, pour into a jam jar and keep in the refrigerator for future cooking (this step may not be necessary). Return to the oven, turning the tray for even colouring. Cook for 1 hour more. Whack the oven temperature up to 220°C/430°F. Cook for another 8-10 minutes, or until the skin puffs up and blisters. The pork scratchings are ready when the skin is crisp and amber, but not burnt. If the skin does need longer, keep checking every 2 minutes to avoid burning. Once cooked, line a plate with a sheet of kitchen towel. Transfer the crisped skin to the plate and blot with another sheet of kitchen towel on top. Best eaten within 2 hours, although leftovers can be stored in an airtight container, out of the refrigerator.